Even if a grapefruit tree (Citrus paradisi) never bears fruit, it forms an attractive subtropical shade and blossoming tree about 20 to 25 feet tall and wide. It is grown in U.S. Department of Agriculture hardiness zones 9 through 11. The hotter the summer, the sweeter the fruits become. Grapefruit trees grown from seed are slower growing that those varieties grafted onto tougher, more disease-resistant rootstocks. 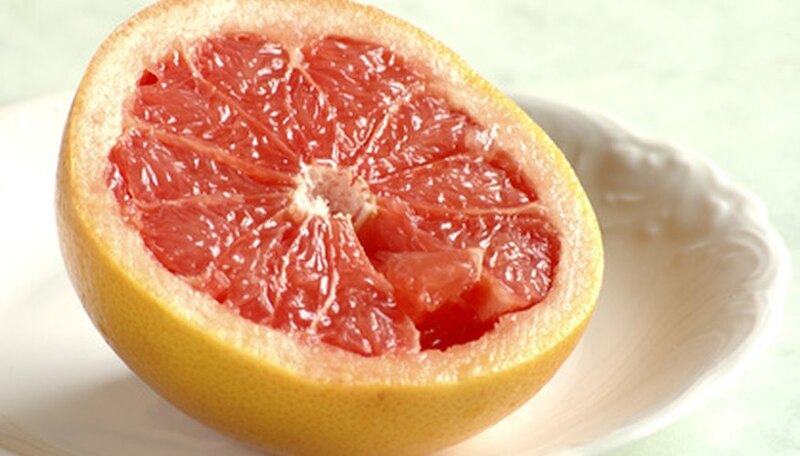 Grapefruits are believed to have arisen in the Caribbean when an unplanned hybrid between a pummelo and orange occurred. Grapefruits, like any other citrus fruit tree, need a well-drained soil that never remains soggy after irrigation or rain. Sandy and loamy soils rich in organic matter are ideal. Fast-draining soils also result in faster leaching of nutrients. Thus, gardeners choose to apply synthetic fertilizer granules to supply the nutrients for best tree health. In the American Southwest, nitrogen is a key nutrient naturally lacking in many native soils according to "Sunset Western Garden Book." In Florida, supplying nitrogen is equally important, but the high amount of rainfall quickly leaches out micronutrients like iron, magnesium and manganese. Plants use fertilizers to supply various necessary minerals. In citrus-growing regions, "citrus-special" fertilizer granules are available for purchase, formulated to provide amounts of nutrients based on a region's native soils. Typically, fertilizers for grapefruit trees are well-balanced, having nitrogen, phosphorus and potassium in large, nearly equal amounts and a wide array of micronurients. These products reveal a prominent triple formula ratio like 6-6-6, 8-8-8 or 10-10-10. They also often state "with micronutrients" prominently, too. Closer inspection of the label shows a list of micronutrient percentages. Nutrients must be available in the soil to support the initial growth spurt in spring on grapefruit trees. Subsequent fertilizer applications occur in early summer and again in late summer to ensure the breakdown of the slow-release fertilizer granules keep the soil rich in minerals for roots. Fertilization of citrus trees in regions that sustain some winter frosts tends to end in late summer, according to "Sunset Western Garden Book." Both the Universities of Arizona and Florida comment that young trees need more frequent applications of fertilizer. According to reference charts posted by both universities, a smaller overall amount of nitrogen is needed by smaller trees but is supplied over more-frequent fertilization events. Older, larger trees need much more nitrogen, but the fertilizing occurs no more than three times a year. Once a tree is five years old, provide it with 1 lb. of nitrogen for each year of age, up to a maximum of 10 lbs. at a time. Grapefruit trees do not require as much fertilizer as orange, lemons or limes. If you currently use a successful citrus fertilizer regimen in your orchard, consider backing off that fertilizer amount up to one-half on grapefruits. Keep in mind local soils affect the amount of fertilizer needed. If tree foliage yellows, it's indicative of a deficiency of either iron, magnesium, zinc or manganese.